Many wine lovers face a dilemma. They’d love to start a collection (or have already begun one! ), but they don’t have an out-of-the-way space for a wine refrigerator, and they’d rather not put that piece of equipment in their perfectly-decorated dining rooms. What they need is a wine storage solution that is both functional and aesthetically pleasing. But does such a thing exist? Budding wine collectors will be happy to know that the perfect solution does indeed exist. It’s called a wine credenza. A wine credenza is a piece of furniture that also has climate-controlled wine storage. Wine credenzas are often used in the place of a traditional buffet in a dining room. Instead of dishes stored inside, the cupboards are filled with your favorite vintages, aging away under ideal conditions. The top of the wine credenza can be used to display art, serve as a bar area, or hold dishes during gatherings like Thanksgiving. Don’t have space in your dining room for a wine credenza? Think outside the box. Since wine credenzas don’t take up too much space–they’re only about 30 inches deep, they are also a perfect fit for hallways. Wine credenzas can also work in family rooms…you could even replace your TV stand with one! From a design standpoint, the best thing about wine credenzas is that they can be completely customized to fit in to your existing decor. For those with traditional taste, there are credenzas like this Provance 3-door credenza from Vinotheque, available in light, medium and dark stains to blend it into your existing furniture. For those with a bolder aesthetic, there is this Vinotheque Boxed Up 4-door credenza, with a wooden exterior mosaic made of traditional wine shipping boxes. (This design would be great in a wine cellar!) For those homes with an industrial feel, try the clean, modern look of this Vinotheque AlumaSteel 3-door credenza. 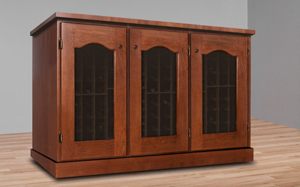 Besides being beautiful, these wine credenzas really work to store and age your wine properly. Vinotheque credenzas are designed with your growing collection in mind–they all maximize the number of bottles they can hold while minimizing the overall size of the cabinet. These credenzas have top-of-the line cooling systems and insulation, along with UV-resistant glass that blocks harmful rays from damaging your wine. Many of these credenzas can also be made with a front venting option that allows the credenza to be custom-built into existing furniture. Whatever your style, if you’re a serious collector who is looking for a storage option that will fit seamlessly into your home, a wine credenza might be the right choice for you.